On a recent trip to Nashville Casey Kearney reconnected with Producer Doug Kahan. Doug produced her 2016 debut EP of original songs, “Faster” which has been very successful locally. Casey presented Doug with the idea of recording stripped down versions of some of her most requested cover songs. Doug was ready to work and did all of the instrumentation and production himself, including the mandolin and dobro featured on one of the songs. “Somebody’s Favorite Song” is the title of the album. Each song has a story of its own attached to it; someone or something inspired its selection. Some of the other songs such as Chris Stapletons “Broken Halos,” Jewel’s “You Were Meant For Me” and Jack Johnson’s “Better Together” Casey learned specifically for friends or family who attend her shows. “I learned these for certain individuals. When I started performing them at my shows, I found that many other people connected to them and they became instant favorites.” Casey said. Also included is “That’s What I Like About You,” a Trisha Yearwood song from 1991. It goes all the way back to Casey and her two sisters jumping on the bed singing into their hair brushes. She never thought she would grow up to be a performer at that time. Casey did not start singing or playing instruments until she was in her mid-twenties and raising a family. Things changed quickly when she started actively playing music locally. In 2018 she was named Beachcomber Magazines “Best Country Artist.” Casey was an artist in the 2019 30A Songwriters Festival, which was a personal goal. “I have a list of things I want to do in music, and the past year or two I have been able to check quite a few of those off such as playing at the Bluebird Cafe in Nashville, it was a big deal for me,” Casey says. Casey is president of a charity organization called Bands of 30A, which has raised over $80,000 in just one year for local charities. She is also a vocal coach for young students interested in singing, a worship leader at Christ Family Church in Crestview, a wife and mom of three busy kids. When she is not playing music, she is riding horses as much as possible at her home in Holt, Florida. This 11-song album features old classics and current hits with Casey’s unique take on each one. The public is invited to celebrate the new music at the Album Release parties. There will be one held in Santa Rosa Beach at Shunk Gulley, Thursday February 21 at 7PM. The other will be held in Casey’s hometown of Crestview, FL at Casbah Coffee, Friday February 22 at 7PM. Susan’s Restaurant, Panhandle Orthopaedics, and Main St. Land and Title have sponsored these events. More information, music and merchandise are available on her website www.caseykearney.com. The new album, “Somebody’s Favorite Song,” will be available everywhere February 22. 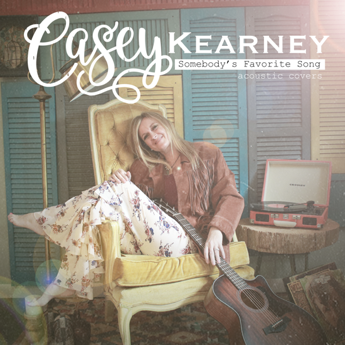 Listen to all of Casey Kearney’s music on Spotify, itunes, Google Play, Pandora, Amazon and more. This entry was posted on February 17, 2019 by 850music in Posts and tagged press release.